The 86th Legislative Session is officially over half way complete! With 63 days left to go until the Legislature adjourns, activities are ramping up in the Capitol. Now that we’ve surpassed the bill filing deadline, bills are being laid out in committee and are beginning to be voted out of the House. This week, the House will be focused on finalizing the proposed state budget. On Wednesday, it’s Budget Night! That means on Wednesday, House members will have the opportunity to propose amendments to the budget on a wide array of issues. There have been 307 budget amendments filed, so we will likely be debating these proposed amendments until late in the evening. I’ll be doing a Facebook live on the House Floor to hear from other legislators about their budget amendments and their first impressions of the budget. If you have Facebook, and would like to follow along, follow me here. Each session, the Legislature is constitutionally required to pass a budget. That means, both the Senate and the House have to agree on what our funding priorities will be for the next two years. This process between both chambers always proves difficult so we will be closely monitoring how the budget changes throughout the rest of session. HB 1255 which requires medical records related to maternal mortality to be submitted to the Department of State Health Services within 30 days for the Maternal Mortality & Morbidity Task Force to review. HB 1307 which establishes a Statewide Disaster Case Management System to assist the Texas Division of Emergency Management process requests for federal assistance, and streamline the collection of resources, staff, and status information from communities affected by recent natural disasters. HB 74 which would give all public sector employees notice of the Public Service Loan Forgiveness Program. Under this program, an employee of a public employer can have ALL of their student loans forgiven after 10 years of on-time payments. I believe the least we can do is provide employees who are dedicating years of their career to serve in the public sector access to this important opportunity. For a full list of the bills we’ve filed, click here. Our Education for All group focused on HB 3, which is the House’s proposed plan for public school finance, and HB 43, my bill relating to disciplinary policies for open enrollment charter schools. The group also discussed my bill, HB 2797, which I call the Rosedale School bill. The Rosedale School is located in HD 49 and serves students who have significant disabilities, including children who are medically fragile or who need intensive behavioral support. This bill would look to adopt fair accountability and evaluation indicators for schools like Rosedale. The Democracy and Equality team discussed Secretary of State David Whitley’s confirmation process, SB 15, and my bills HB 3281, which would limit the use of a victim’s gender identity or sexual orientation as the basis for a defense in a trial, HB 375, which would require polling locations on certain college campuses, and lastly, HB 2960, which would limit non-compete agreements for low-wage employees. Even with session in full swing, we will continue to host our monthly engagement team meetings. Thank you to everyone who has been able to participate. Your opinions and participation in the engagement team are so important to our community and greatly assist me in representing HD 49 as well. Below are the dates for our upcoming meetings. If you haven’t already, please be sure to sign up to receive notices about each respective engagement team meeting. We would love to have you join us, if you’re able to make it! 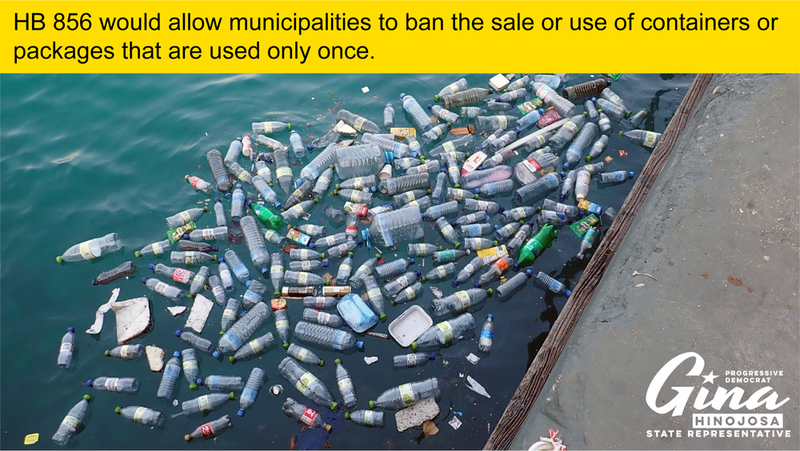 HB 856 would allow municipalities to ban the sale or use of containers or packages that are used only once. Recently, Texas Courts determined that state law preempted these types of ordinances. Before this ruling, the City of Austin approved the single-use carryout bag ordinance in 2012. By 2015, there was a 75% reduction in the number of single use bags in Austin. This bill would allow local municipalities to represent their community’s values as more and more cities are moving towards zero waste. The session is in full swing, and I cannot thank you enough for the opportunity to represent you at the Texas House. Please reach out to my staff anytime or call the office at 512-463-0668 if you have any follow-up questions or comments.